There are clear social, economic and environmental benefits associated with ESD in regional subdivisions. In the final report gaps and opportunities were identified for environmental sustainable development (ESD) for subdivisions in Regional Victoria, including a roadmap for achieving ESD subdivisions. The Environmentally Sustainable Design for Subdivisions in Regional Victoria report aims to assess how greenfield subdivisions can be more environmentally sustainably designed and delivered to achieve multiple benefits in the most cost effective way over time. Eight regional councils formed a partnership to explore the feasibility of embedding ESD in subdivisions. The partnership engaged AECOM to prepare a report. In Regional Victoria the majority of residential developments require a planning permit, however there are significant gaps in the planning provisions and requirements in ESD principles in current planning and building regulations are relatively minimal. Define ‘best practice’ ESD with respect to urban land subdivision and determine how it should be measured. Establish how ‘best practice’ ESD subdivisions are feasible in regional Victoria. Recommend a suite of tools and a model for collaborative implementation, with transferability across the State. The report analysed the policy and planning context of ESD for subdivisions including building regulations, strategic and policy directions, Victorian planning schemes as well as manuals and guidelines. Stakeholder feedback was also incorporated. The report concluded that greenfield subdivisions require a tailored approach in a regional context; supported by education, advocacy, communication, policy and regulation to ensure the uptake of ESD principles in both subdivisions and individual dwellings is improved. 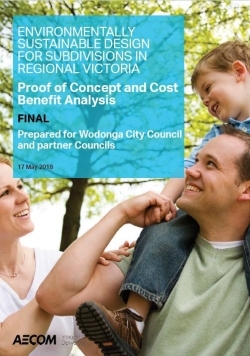 As a result of all the above, in the final report principles and initiatives were proposed to guide better ESD outcomes of subdivisions in Regional Victoria. Also, an analysis and estimation of ESD benefits were provided, and a roadmap for achieving ESD subdivisions was delivered in the report. Non-statutory measures such as education, information, tools and incentives.